Time is the commodity, which none of us seems to have enough of. For those who make their own class videos, I’d like to save you some time. Based on most cloud based video services, the average watch time of a video is 2:03. When we’re thinking about educational videos I like to think of this as the maximum per video in an introductory or 100 level course, perhaps adding about 2 minutes per course level maxing out at around 10 minutes. However, different disciplines may have different student demographics, and for those faculty I’d like to show you a way to check out how much your students are watching. 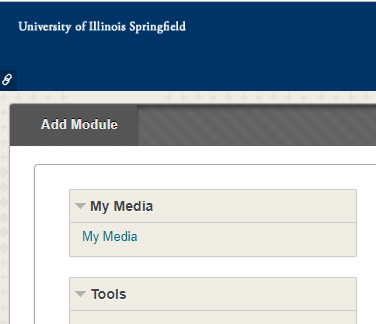 When you first login to BlackBoard, on the left, usually at the top is the My Media option, click on it. You will then see a list of your media you use in your class, select one of the videos to click on. Either click on the video or the video title. Below the video on the right is a back button and an actions drop down menu, select the actions drop down menu and select analytics. You will then see the analytics for the video. There is some interesting data about the video, which is about 27 minutes. It has been visited 29 times, and played 24 times. To protect student information I am not showing that on the right of the analytics screen you can see which students played the video, and the number of times they did so. Several students played the video a few times. I can edit and split this video into three smaller videos of about nine minutes each which should be lower than the 10:43 overall. Then next semester see if the average view time overall for the three videos has increased. I can see what I am covering in the video, and rerecord it in one smaller segment or several smaller segments aiming for each to be under 10:43. Then next semester see if the average view time overall for those videos has increased. So where does the time savings come in? If we know the average overall time our students are watching our videos and we make them within that range, then can save that time to create a shorter, better video they will be more likely to watch entirely. If you’re reshooting your videos, please think about adding audio descriptions to the video. In practice this means if you’re using images, , talking through a PowerPoint, or walking through something on your computer in the video describe what you are doing. It usually takes around three times the runtime of a video to accurately caption it. So a ten minute video takes about thirty minutes to caption, an hour video, three hours. If we make more succinct videos the captioning time overall is decreased. A final note. On the analytics screen in the upper right there is a dropdown menu which should default to 30 days. You can choose the amount of time the analytics cover. 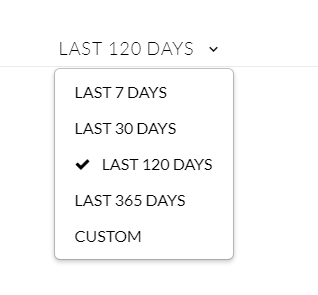 So if you are looking back on a Fall video, select Last 365 days, if you’ve used it for several years use the custom setting and go back as far as you want. Explore the new Adobe Slate and Voice iPad apps, which allow you to tell stories. Slate allows you to create scrolling stories from pictures and text. Voice helps you to create videos from text and images with background music and transitions. Beyond being attractive, these stories are mobile-friendly! The apps are currently FREE to download. Slate is also available for use through a web browser on your desktop, though handout focuses on the iPad app only (they work in the same manner). You will need to create a free Adobe ID in order to use these tools. Consider this tool for use in presenting course content and for student presentations. Topics included: navigating and building projects with the apps, importing photos, importing text, project privacy, making projects accessible, and including projects in Blackboard courses. Videos can enhance your course by offering examples, explanations of concepts, and can be a visual for your students to refer to when learning new content. Brookens Library has many films freely available through film collections to which the campus subscribes. If you find a video you would like to include, contact the library for help linking to it in your Blackboard site. If the film you wish to show is not available in these collections, it may be available in the library’s film collection or available for purchase. The library can work with you to find obtain copyright clearance for the film. You can also request that your students find a film at a local library or video store. Contact your Brookens Library Liaison for help teaching your students to use the WorldCat database to find films at their local library. YouTube and Ted.com are just two of many great sites for free video on the Web. The embed codes provided by sites like these make it easy to add the videos to Blackboard. The Library of Congress created a National Screening Room collection of American films from 1890 to 1999. Copy the embed code from the video website. Go to your Blackboard course. 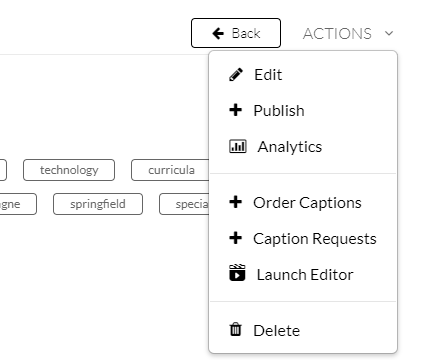 In the upper right corner of your Blackboard site, make sure Edit Mode is ON. Click on the content area in which you would like the video to appear (for example, Course Materials or Course Information). Enter the title of your video next to Name. In the Text box that appears on the screen, click on the HTML button to view the HTML code. Paste the embed code you previously copied. Check out a digital video camera from ITS or record your screen using Camtasia Relay. Once you have created your video, you need to put up for your students to see it. Please upload the video to Kaltura Media through Blackboard. Learn more about Kaltura Media here. Remember that large files can take a long time to download if a student has dial up internet service. Please be careful not to upload videos directly into your Blackboard course. Always link from an outside source as stated above. Videos should supplement content. Use videos to explain text book content more in depth, create examples of concepts, and extend the learning environment with outside curriculum resources. On the Learn, Lead, Grow blog, Matt Bergman shared 4 Tips for Using Video More Effectively. These tips are easy to integrate! Do Captions Help Students Learn? September 1, 2017 / Emily Boles / Comments Off on Do Captions Help Students Learn? The WCET Frontiers Blog featured Dr. Katie Linder, Oregon State University Ecampus, who discussed a national research project on student use of closed captions and transcriptions. The Oregon State University Ecampus Research unit and 3Play Media worked together to conduct a national study on student uses and perceptions of closed captions and transcriptions. The important results show that while these resources are not yet widely available, many students, even those who may not need these resources as an accommodation, are able to use transcriptions and captions to increase their success. Narrated lectures, when properly structured and brief, can be a good tool to deliver course content to your students. We recommend that you “chunk” your lectures into smaller manageable pieces no longer than 5-7 minutes. Chunking accomplishes three things for you. First, by breaking the lectures into brief topics, the likelihood of being able reuse a lecture in another course increases. Second, it is easier to update or re-record a single short video than a longer video. Third, it is easier for your students to find time to sit and concentrate for less than 10 minutes. Remember to write a script for your lectures. It will help keep you from using verbal fillers and keep your videos brief, but more importantly, the script gives an alternative content piece to present to students who cannot hear your lecture and for visually impaired students. It is also very easy to create captions for your lecture by using the YouTube caption editor. Narrated PowerPoint lectures give you the opportunity to present your materials in a visual way, and can help you reach students who are visual learners. Try to include images that enhance your lecture. Replace text descriptions with visual representations of your topic — flow charts, graphs, diagrams, photographs, artwork, maps. Visuals will add value to your lecture and help to keep you from reading every word on your slide — something that students could easily do for themselves. 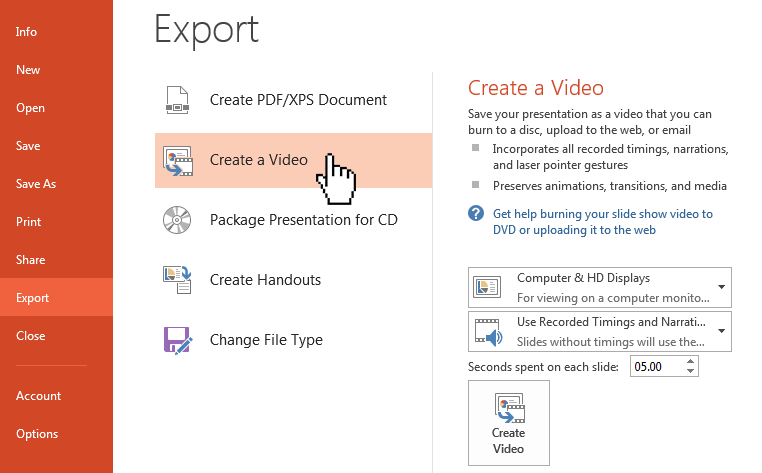 If you have your original PowerPoint and Audio files, you can convert them to videos that can be uploaded to Kaltura. 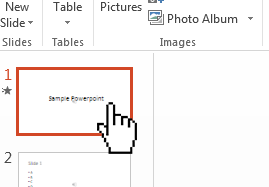 First, convert the PowerPoint and audio files to an .mp4 video using PowerPoint. If you do not have audio files outside of the PowerPoint/Articulate proprietary format, the audio files can be exported for this process. After the video file has been uploaded to Kaltura, you may add chapters to the video to mimic the table of contents feature in Articulate. In a previous post, we explained two options supported by the university for hosting video content in your online courses: Kaltura and YouTube. Today, we will explain how to make sure your YouTube videos are fully accessible using YouTube’s built-in closed captioning feature. Option 1: I already have a transcript. When you are signed in to your YouTube account, navigate to your video and click the CC button directly underneath the video player. Click the blue button, Add new subtitles or CC, and select your language (usually English). Select the option to Upload a file. For file type, select transcript. 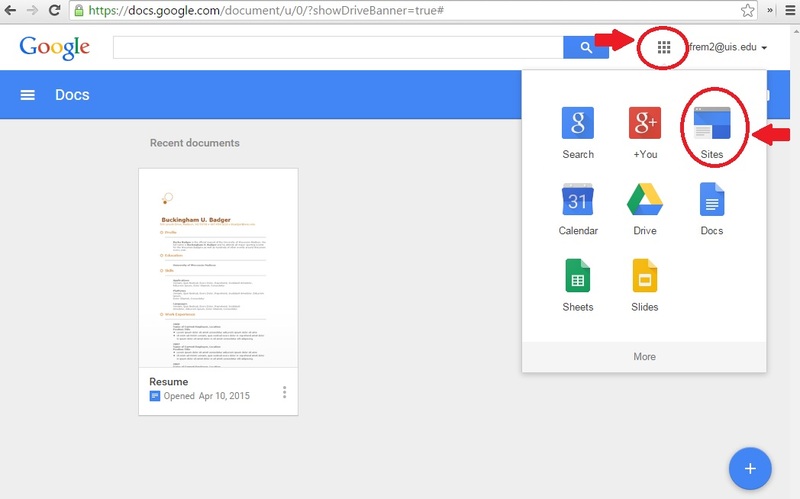 Click Choose File, and find the plain text file that you created in step 1. Click Upload. Your transcript should then appear in the text box. You may watch your video once more and double-check your transcript for accuracy, or if you are confident with what you have uploaded, simply click the blue Set timings button. That’s it! YouTube will automatically scan your video and text, and create accurate, correctly-timed closed captions. Option 2: I need to create a transcript for an existing recording. YouTube’s auto-captioning feature is surely not perfect, but it is getting more accurate as time goes on and Google is able to harvest more and more voice data. Auto-captions are created automatically after you upload a video, usually within several hours after uploading. (Sometimes, it may take up to one day before auto-captions will appear. Unfortunately, there is no way to speed this process up; all you can do is keep checking after you’ve uploaded a video to see if they are ready. )To check if auto-captions are ready for your video, go to your video’s closed-captioning settings using the directions in step 2 above. Once they have been created, they will appear like this: Click on the captions, usually titled “English (Automatic)“, and then click the blue Edit button. You can then play the video and jump from caption to caption to edit for accuracy. Once you are finished, simply click the blue Publish edits button. 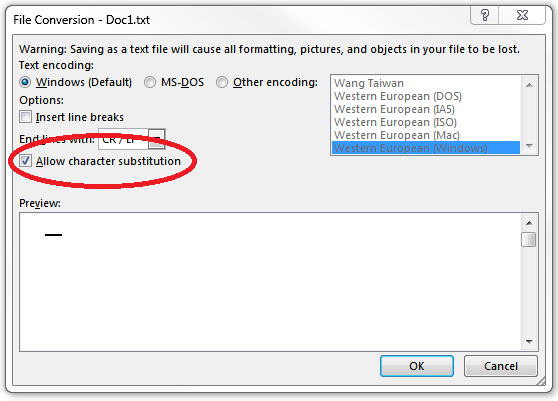 This option is the most time and labor intensive option, but usually produces the best results (if you didn’t use a script).To use YouTube’s built-in transcription feature, simply follow steps 2 and 3 above (go to your video’s closed caption settings, and select the option to “Add new subtitles or CC.”) However, instead of uploading a file, you’ll select the option to Transcribe and auto-sync.On the following page, you may play your video and begin typing what is spoken into the text box. YouTube will pause the video while you are typing automatically, making it easier to type what you hear, as you hear it, without falling too far behind. When you have finished typing what is spoken in your video, click the blue Set timings button. After several minutes, YouTube will have automatically timed the text to the video, creating accurately timed closed captions. We get it – you are busy, and it takes time to make sure your content is accessible. The technology behind accessibility can also feel overwhelming at times. We’re here to help you, though! Any of the professionals at COLRS are available for one-on-one tutorials or departmental workshops in which we can teach you, face to face, how to use this technology and ensure your content is accessible to all students. To set something up, or if you just need some help along the way as you try this yourself, please don’t hesitate to contact us. 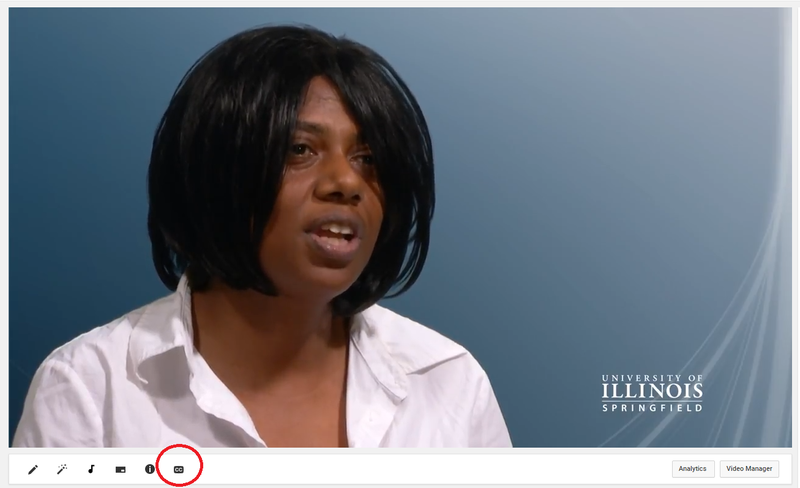 UIS offers instructors two options for posting accessible videos with captioning in online courses: Kaltura and YouTube. In this post, we’ll explain the differences between both options, and when it’s better to use one over the other. Access to analytics, including the number of times a video has been viewed, devices and platforms used to view the videos, the drop-off point of videos, and more. Machine-generated closed captioning is available. All faculty, staff, and students at UIS have access to individual YouTube accounts through our Google Apps for Education license. 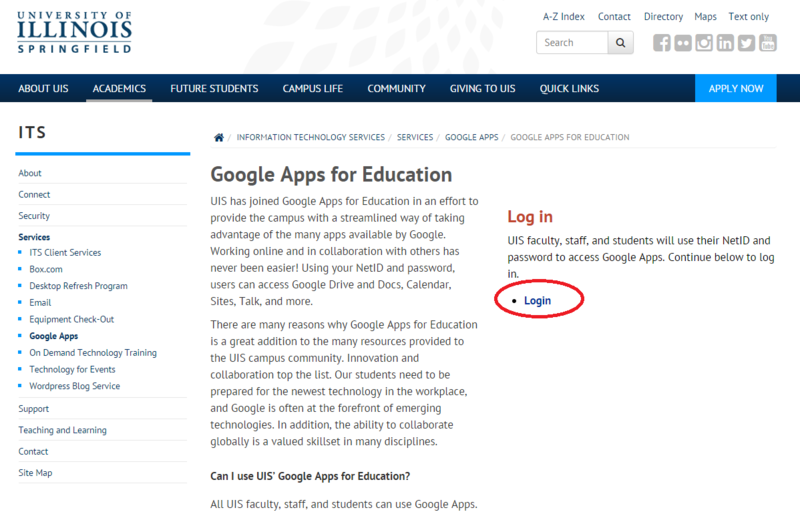 This means that practically anyone affiliated with the university has access to most Google products, including YouTube, with their existing UIS NetID and password. Regardless of the video platform you choose to use, you should ensure that your content is accessible, and that you have proper copyright permissions if you use anything that you did not produce yourself. Learn how to use YouTube to make closed-captions. Please feel free to contact COLRS anytime to further discuss Kaltura, YouTube, captioning, and accessibility. The New York Public Library’s digital collections are vast. In early January 2016, they added more than 180,000 of its public-domain holdings to the digital collection. Visitors will find maps, posters, manuscripts, sheet music, drawings, photographs, letters, ancient texts, all available as high-resolution downloads. “These changes are intended to facilitate sharing, research and reuse by scholars, artists, educators, technologists, publishers, and Internet users of all kinds,” the library says in a statement. Documents range from literary manuscripts and sheet music to maps, atlases, and stereoscopic views. The library also notes that the documents include Farm Security Administration photographs, papers from Founding Fathers, WPA-era art by African-American artists, the 16th-century Handscrolls of the Tales of Genji, and illuminated manuscripts from the Medieval Ages and the Renaissance. The materials can be viewed and downloaded at the Digital Collections site. Having trouble imagining what 180,000 images might look like? The NYPL also created a visualization of all the materials, sorted by date, genre, collection or even color. A lithograph of New Orleans, by the artist Henry Lewis and the lithographer Arnz and Co., is among the more than 180,000 public domain items now available for high-resolution download from the New York Public Library. “Muhammad and Abu Bakr are feted by Umm Ma’badah’s tribe,” from a 16th-century illuminated manuscript depicting the life of the prophet Muhammad. An early-20th century photo by Edwin Levick, “Uncle Sam, host. Immigrants being served a free meal at Ellis Island,” is part of the NYPL’s photography collection. The NYPL’s digital collections include a number of maps in the public domain, like this 1672 world map by Pieter Goos. Because ITS subscribes to Google Apps, we have a plethora of free Google tools at our disposal that we can use to enhance online education and research. The best part is that everyone with a UIS NetID has access to all that Google has to offer, without having to register for a new account! One of these tools is Google Sites. There are a variety of ways that you can use Google Sites right now in your online classes, or for professional development or research purposes: You can use Google Sites to create an e-portfolio, to showcase your CV, or even as a more accessible alternative to PowerPoint. Sign in with your regular NetID and password. Next, click the Apps button at the top of your screen, to the left of your email address. Select Sites. You will now be directed to a page where you will be able to choose different details about your site. First, you may choose a template for your site based on its purpose. To view more templates, choose “Browse the gallery for more,” which will give you the option to choose the best template for your site. Note: For faculty completing online professional development through COLRS, search for “Online Faculty Development ePortfolio.” Select this as your template. Or choose “Blank template” to start a site from scratch. 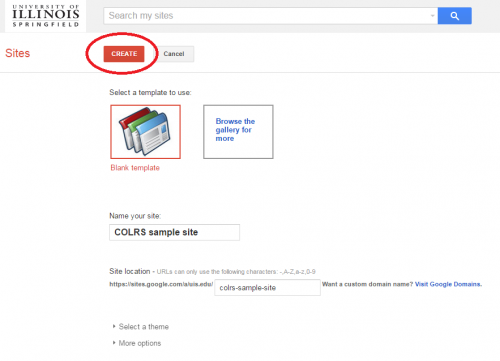 After selecting a template, you will name your site and complete the URL at which your site will be located. There are also two optional menus that can be expanded: Click on “Select a theme” to choose a color scheme for your site, and click on “More options” to enter site categories and a short description of your site. Most people do not change anything here and leave them blank. Once you are done choosing your template, naming your site, and typing a short URL, click Create at the top of the page. You will now be at the homepage of your site! You are now ready to begin adding content, including additional pages, images, documents, videos, and more! We are always available to assist you in brainstorming ideas on how you might implement Google Sites in your courses, or to help you set up a Google Site before a big presentation at a conference. We can also provide guidance with the Online Faculty Development ePortfolio template. If you need additional tech support, contact ITS at 206-6000, or techsupport@uis.edu. First, open your PowerPoint presentation. 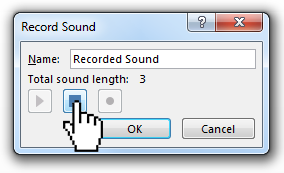 Click ‘Insert’ -> ‘Media’ -> ‘Audio’ -> ’Record Audio’. 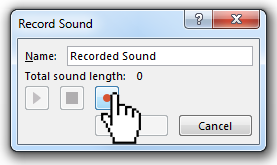 To begin recording, click the record button. It has a red circle. Read the content for that slide. Make sure to speak into your microphone. To stop recording, click the stop button. It has a blue square. 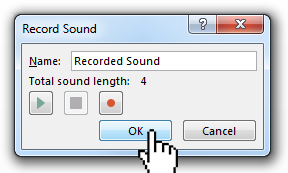 Optional: To test that your recording sounds acceptable, click the play button. It has a green triangle. 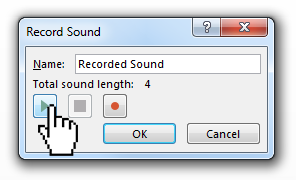 Click ‘OK’ when finished to complete the recording for the slide. Repeat these steps for each slide you wish to narrate. Finally, you can export to video when audio recording has been completed. Click ‘File’ -> ‘Export’ -> ‘Create a Video’. For the video quality, select ‘Computer & HD Displays’ to ensure the highest quality. For timings and narrations, select ‘Use Recorded Timings and Narrations’ to ensure your recordings are included in the video. 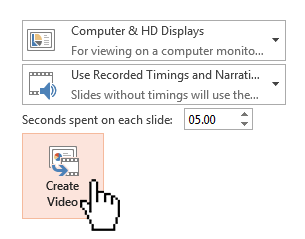 Optional: If you have slides without narration, you can adjust the default duration of 5 seconds for these slides. Click ‘Create Video’. You can name your video and select where to save it. Now that you’ve created your video, follow these instructions to upload the video to Kalutra through Blackboard. On February 17, the COLRS Staff offered a presentation titled “Emerging Technologies for Education” through the UIS Faculty Development Office. The following is a list of technologies presented along with others that are among the new favorites for online educators. Even if you haven’t added captions to your video, YouTube may use speech recognition technology to automatically make captions available. Since these are automatically generated, the quality of the captions may vary from video to video. As the video owner, you can always edit the captions to improve accuracy, or remove them from your video if you do not want them to be available for your viewers. Fangs renders a text version of a web page similar to how a screen reader would read it. The ambition is to help developers understand how an assistive device would present a website and thereby increase chances of finding accessibility issues early. Present.me is the fastest and easiest way to add video or audio to your document or presentation, so that who ever is viewing gets the whole story – as if you were in the room with them! Vialogues (which derives from “video dialogues”) is an award-winning discussion platform that proves that videos are both powerful teaching resources and the ultimate conversation starters. Vialogues provides a space for users to hold meaningful and dynamic time-stamped discussions about videos. The ShowMe iPad app lets you create lessons using a whiteboard. The app is free and there is no limit what you can teach! Our community has created millions of ShowMes, from chemistry to history to football strategy – and more knowledge is being shared everyday. Swivl was founded in 2010 by Brian Lamb and Vladimir Tetelbaum, with the idea of making video a more useful tool with robotics. They launched the first concept to market through crowdfunding on IndieGoGo, and have been engaging with users and improving solutions ever since. This culminated with the launch of the second generation Swivl and Swivl Cloud in April 2014. The Leap Motion Controller senses how you naturally move your hands and lets you use your computer in a whole new way. Point, wave, reach, grab. Pick something up and move it. Do things you never dreamed possible. Expand your classroom: Students can join from home or even from other schools to make the classroom community even bigger. Embrace the backchannel: The backchannel improves meetings, presentations, Socratic seminars and fishbowls, movies and silent activities, reviews and snow days, and more. Empower learners: TodaysMeet gives everyone the floor and lets even the quietest students express themselves. A simple, easy-to-use, cross-platform tool that helps you organize your life. BibMe is an automatic citation creator that supports MLA, APA, Chicago, and Turabian formatting. BibMe leverages external databases to quickly fill citation information for you. BibMe will then format the citation information and compile a bibliography according to the guidelines of the style manuals. Flipboard is a social-network aggregation, magazine-format mobile app localized in more than 20 languages. The software collects content from social media and other websites, presents it in magazine format, and allows users to “flip” through their social-networking feeds and feeds from websites that have partnered with the company. Flipboard is produced by Flipboard, Inc., a United-States-based software company founded in 2010 by Mike McCue and Evan Doll and headquartered in Palo Alto, California. WhatsApp Messenger is an instant messaging app for smartphones that operates under a subscription business model. The proprietary, cross-platform app enables users of select feature phones to use the Internet to communicate. In addition to text messaging, WhatsApp can be used to send images, video, and audio media messages. WhatsApp has also started rolling out the much awaited voice calling feature. Locations can also be shared through the use of integrated mapping features. s a suite of integrated mobile productivity apps. The company’s first product, the Any.do task management app, was launched on Android in November 2011 and later for iPhone and Chrome on June 3, 2012. Remind (formerly Remind101) is a private mobile messaging platform that enables teachers to send Reminders to students and parents via text and email.The platform has over 10 million users and sends over 65 million messages per month. As of February 2014, 15% of the K-12 teacher population in the U.S used Remind101. SoftChalk is a tool to help enhance text-based lectures. It allows instructors to “chunk” their content into smaller pages, add images, flashcards, graded or self-test quizzes, and more. Learn more about SoftChalk. Instructors may access SoftChalk using Citrix Virtual Desktop. View instructions for installing and using the Virtual Desktop app. Kaltura Media is the video management solution at UIS. Faculty and students may upload video from other sources (MS Lync, camcorders or phones) or record web cam and/or screen capture videos through Kaltura Capture Space Lite. 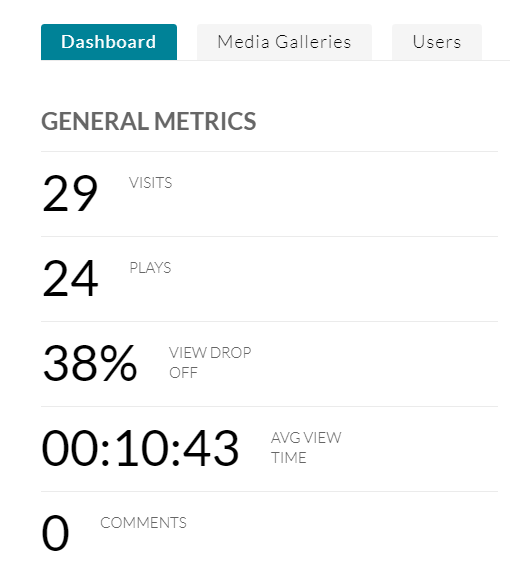 A fantastic feature of Kaltura is the statistics for video use. It will tell you the percentage of your video that each student watch, how many times it was access, and the average view time. 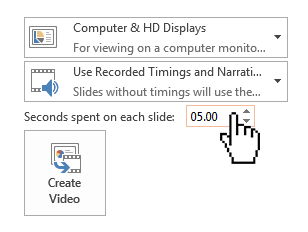 Across UIS, the average view time for a video is 7 minutes and 35 seconds, which is on the longer side of the recommended 5-7 minute length for video lectures. For detailed videos on how to use Kaltura, please see the Kaltura Company’s training videos on Kaltura and Capture Space Lite. Using Capture Space Lite from ITS covers how to sue the cut and trim tools to edit your video. How to Upload Skype for Business (MS Lync) Recordings (PDF) from ITS gives step-by-step instructions for locating recordings and adding them to Kaltura. In the post below, you’ll find step-by-step instructions for uploading video to Kaltura. 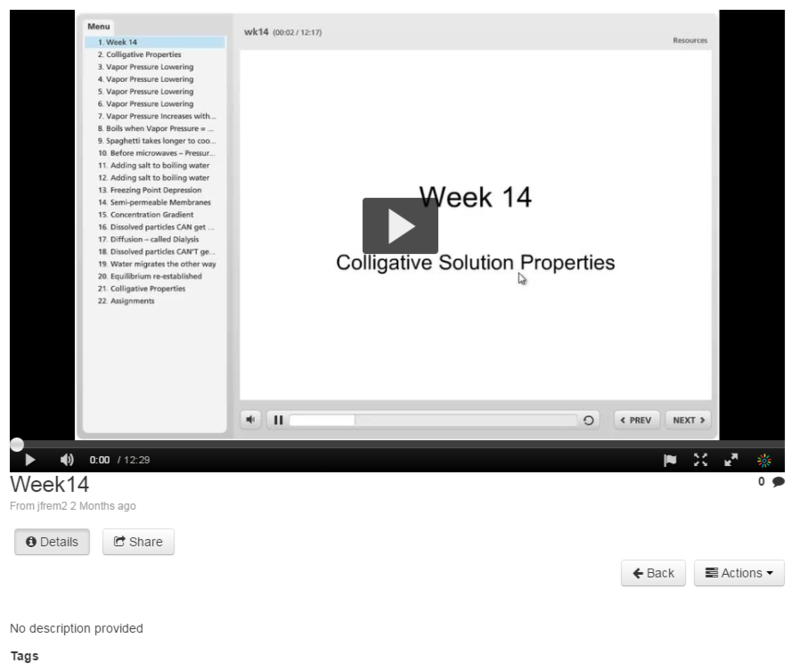 Another COLRS blog post covers including Kaltura videos in your Blackboard course. Faculty and students access Kaltura Media through Blackboard. Click “Choose a file to upload” and select your file. Your video will upload automatically. Depending on the size, this may take a while. After your video uploads, edit the name, description, tags (key words), and privacy settings. Click “Save” to complete the upload process. Follow the steps in this post to add your video a Blackboard course. Kaltura Media is a media management tool built into Blackboard. Recordings made with Capture Space Lite are automatically published to Kaltura. You may also upload videos you’ve created with other tools to Kaltura. Learn More about Kaltura and Capture Space Lite. The thumbnail option adds a preview image to the content area of your Blackboard. When students click on the video, it opens to full size. Navigate to your course and the content area to which you would like to add the video. Enter your search terms (name of the video or any descriptive tags you added to your video) and click the search icon. Also, know that the most recently published videos appear at the top of the list. Click “Select” next to the video you wish to add to your course. Enter a descriptive title for the video. Enter your search terms (name of the video or any descriptive tags you added to your video) and click “Go.” Also, know that the most recently published videos appear at the top of the list. Click on the video you wish to add to your course. Click on Actions to show the menu, and then select Edit. Click on the Embed Code (bottom choice) and and copy it ( CTRL + C or Command + C) to copy the embed code to your computer’s clipboard. Next, go to your course content area (Weekly Materials, Assignments, Syllabus, etc). Enter a descriptive name for the item. In the text box, be sure your menu is expanded (see image below). Click the the URL (it should begin https://cdnapisec.kaltura.com…), and press Press CTRL + C to copy the URL to your computer’s clipboard. Paste (CTRL + V or Command + V) the code you copied to the clipboard in #8 in the “URL” area. Under “Web Link Option,” select “yes” to open the video in a new window. If you do not open the video in a new window, students will not be able to view the video. 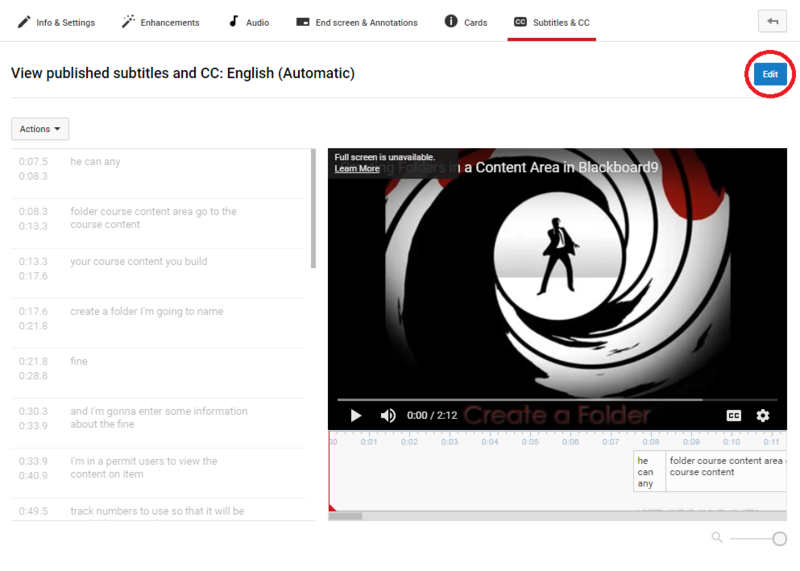 The course gallery option allows you to add a link to your course menu that takes students to all videos for your course. 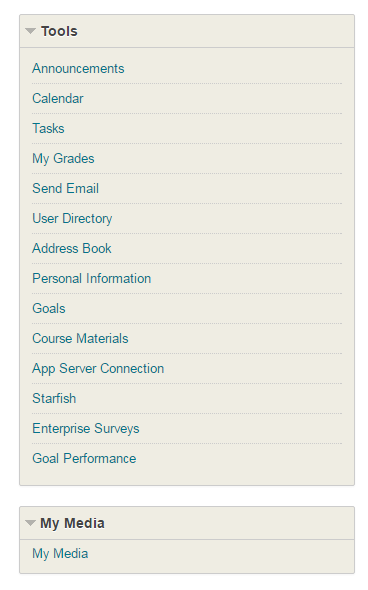 Click on the “+” above your course menu. Enter a name for the link (Media Gallery or Course Videos, perhaps). Select “Media Gallery” for the Type. Check the box to make the area available to users. Select “Published,” and then select the individual courses to which you would like to publish the video to the media gallery. April 10, 2013 / mgribbin / Comments Off on What is Synchronous Learning? Synchronous learning employs a software that provides a way for a groups to meet online, at the same time, and verbally communicate with each other. It allows for real-time learning and collaboration. Not only can participants communicate with each other, but they can also push content to the rest of the audience, such as a presentation or a web page. Additionally, class meetings should be recorded for students unable to attend the meeting or for future use.